These are the second set of attributes in the Globals tab and used to edit the drawing states of GL objects for the current simulator. 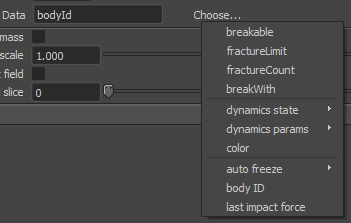 Fracture draw GL items such as colored fragments (event pass colors) and the ground plane. Sometimes the GL fragments are mostly masked by the geometry with only some of the GL color bleeding through. Similar to the Draw attribute except that this it only affects the GL fragments. Draw the center of mass on nodes connected to the simulator. Modify the scale of the center of mass when drawn. Draw per-fragment metadata in the viewport. Options for displaying the vectors of the dynamics state attributes. These attributes are set in the Data attribute, covered below. Toggling through each of the indices displays the vectors as either XYZ coordinates, length or a trajectory line. This is the current metadata that is being displayed in the viewport when Draw numeric is enabled. The available data is selected from the Choose... menu. This page was last modified on 12 July 2012, at 03:39.